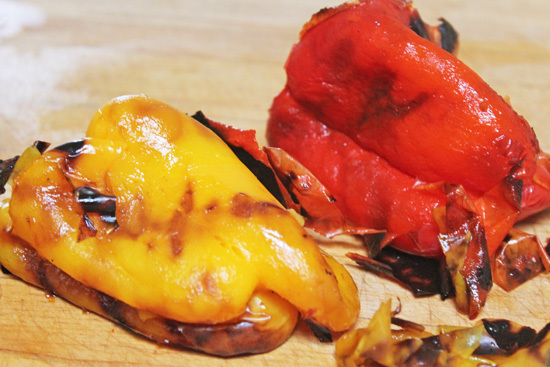 How to Roast a Red Pepper…yellow, orange or green. Roasting peppers at home rewards you in so many ways. The aroma of roasting peppers with the smoke enveloping your room will make you hungry in a healthy way. Sure, you can buy roasted red peppers in a jar, but there is nothing like the real deal…and it couldn’t be easier to make roasted red peppers. All you need is about 20 minutes of advance time when you are hanging out or getting the rest of your meal prepped. Many homes have a gas grill or a gas cooktop, which is the perfect method, but you could roast them under a broiler or in the oven on a baking sheet at 400° if you have no other choice, although it will take a little more time. Place on the grill and rotate so each side becomes blackened. We add some eggplant and zucchini slices for a veggie side dish. I like the gas grill. (Put on the timer, so you don’t forget to go outside if you are going in and out.) It will work the same way on a gas cooktop. Just place the pepper on the grate and wash it after using. We love a simple meal of roasted veggies with a grilled steak and maybe some couscous, particularly in the summer. 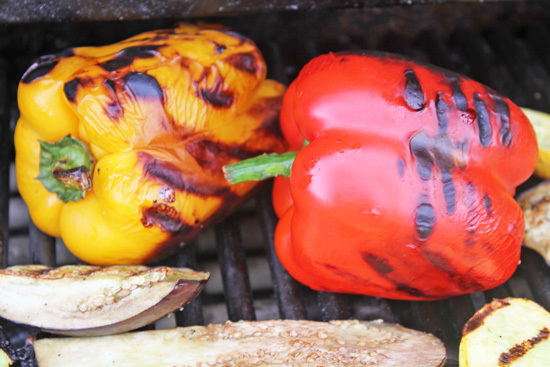 But many times, I just need one or two roasted red peppers and it is easy to put on the grill – no clean up. Yes! Every grill is different, but on my grill, I need to set the grill to medium heat to get the right char without overdoing it. You know the peppers are roasted when they are mostly charred on all sides after rotating with a pair of tongs and they begin to collapse. The aroma of the fresh roasted pepper scent is your first clue that you are there. Peppers are steaming in the plastic bag. Keep them in the bag for 5 minutes or longer. Take a grocery store plastic bag out to the grill, so you are ready. Place the peppers directly into the plastic bag and enclose the peppers, so that they begin to steam. The longer they stay in the bag, the easier it is to remove the skins. Remove the peppers from the plastic bag and enjoy the aroma of the smoky peppers. Remove the skin with your fingers. You will be surprised how easily the blackened skin peels away. This will take just a minute or two. Cut in half and pull out the stem and the seeds. Now pull out the stem and the seeds. Slice the pepper in half unless you are planning to stuff it. You can rinse the seeds away with a small amount of water, but the more you rinse, the smoky flavor will go down the drain. At this point I slice the pepper in strips to top a pizza or dice them for a pasta dish. You can store them unsliced in the refrigerator for a few days to use as needed too. Now that you’ve learned to roast a red pepper, try this same technique with a jalapeno or a chile to add extra flavor to salsa, your favorite Mexican or Southwestern dish or a salad dressing. The skins are thinner on chiles, so you may want to leave the skin on or gently remove it. Try these recipes with your roasted red peppers, Roasted Red Pepper and Sun-Dried Tomato Tapenade or Red Tomato Gazpacho or Roasted Eggplant Salsa = Indian Baingan Ka Bharta or use them in pizza, pasta, tamales or risotto. The possibilities are endless. Entry filed under: Appetizer, Diabetic, Food, Food Blog, Indian, Salad, Vegetable, Vegetarian, WordPress. Tags: chile, jalapeno, red pepper.